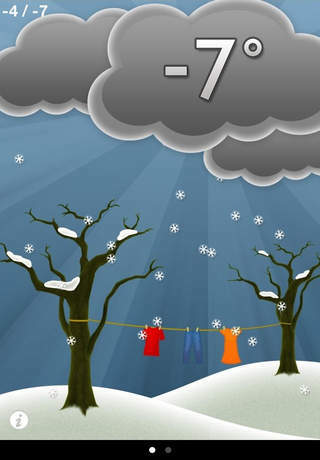 ✰ Apps4Kids ~ Among the several fun and educational apps we have on board of our devices, there should be always a set of helpful apps such as iDress for Weather. ✰ Lockergnome ~ Let’s face it, the concept and mission behind iDress is fantastic. From idea to finished product, it’s clearly a winner with a clearly defined audience. Free of clutter, iDress for Weather provides only the weather conditions that are essential for daily use. Use the beautiful default HD illustrations OR put any photos or images into the iDress customizable closet to personalize the connection between weather and clothing. What’s in your closet? You decide! Everyone interprets temperatures differently. iDress for Weather takes this into account by allowing individual settings of temperature ranges that define hot, warm, cool, cold, and really cold. Until late afternoon, a single swipe to the left will display a closet with clothing to match the forecasted high. In the evening, the closet will display clothing for the overnight low. ♥customize the closet by using personal photos or images. Swipe to left to enter the closet and tap “i” in the bottom left corner to customize the contents. ♥define personal interpretations of temperatures by setting the parameters of hot, warm, cool, cold, and very cold. Tap “i” on bottom left corner for the weather screen, then select “temperature levels”. Tap “configure” to begin setting individualized parameters. When finished, tap “confirm” then tap anywhere on the screen to return to the weather screen or tap ”settings” to make additional changes. ♥humidity, wind speed and wind direction are displayed ONLY if preferred. TAP “i” on bottom left corner, then select “Extended Info”. iDress for Weather was specifically designed support individuals whose cognitive processing or memory is affected by a disability (such as autism or other developmental disabilities) or has changed due to an injury or illness (such as a traumatic brain injury, stroke, Alzheimer’s Disease, or dementia). Please see pebroproductions.com for more information. Don’t hesitate to ask questions, give suggestions or share stories of how iDress is being used to increase individual’s independence or learning! Since iDress for Weather primarily relies on pictures rather than words, it is fully accessible to the global community! ♥Pebro Productions is a member of Moms with Apps, a collaborative group of family-friendly developers seeking to promote quality apps for kids and families.